This year a very dear friend turned vegetarian. A favourite restaurant in the city turned vegetarian. It was a delight to dine at Kryptos Vegetarian at Wallace Garden. 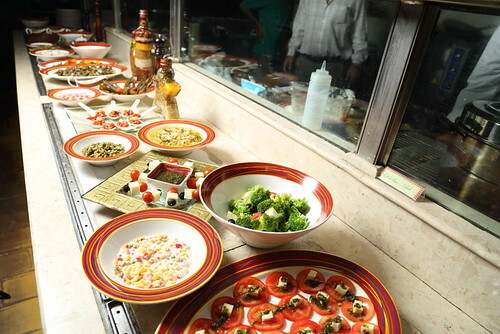 From starters and a fabulous spread at the Salad bar to the Burritos, Pizzas, Indian rotis, Pulavs and exotic desserts such as Moussaka, Eggless Tiramisu, Baklava & Panna Cotta (I freaked out on the Peach Pie), it is an absolute treat for food lovers in Chennai. I recently dined there with my two brothers. The menu looked promising. I had enjoyed the salad buffet the last time I had been there – that counter is irresistible! But I let go of it since I wanted to taste other dishes . We ordered the mixed snack platter and enjoyed the hummus and pita bread, the spinach parcels with pinenuts was the winner in this round. For snacks, we dug into the baked wantons – perfect! Both the soups we ordered were delicious. In the Main grills, the baked rice peppers were mildly flavoured and cooked perfectly. And to end, even though I am not a great dessert fan, the baklava was mind-blowing. 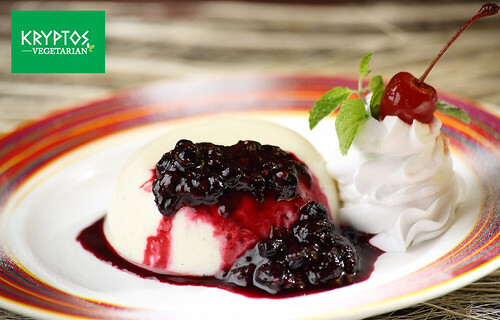 What is heartening is that the Panna Cotta is made with Agar Agar & not with Gelatine. 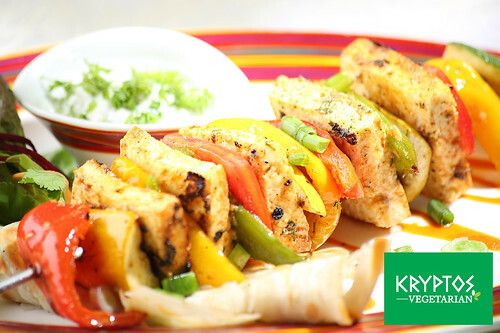 As the owner Vipin Sachdev stated, “Every dish here at Kryptos is 100% vegetarian. A few of our dishes in all our restaurants also have a “J” written besides the dish. This means our guest can ask for this dish to be made keeping the Jain sensibilities in mind.” Vipin’s passion for life, and as a foodie, is all beautifully reflected in the detailing that makes this restaurant a place for fine dining!